La Graciosa is volcanic island just offshore from the north coast of Lanzarote in the Spanish Canary Islands, home to a humble population of just 700 and often referred to as the 8th island of the archipelago. Devoid of tourist attractions and hotels, La Graciosa simply offers 29-square-kilometres of golden sand and volcanic cones, with beautiful beaches and unforgettable dive sites featuring on the day-to-day itinerary. Sitting just north of Lanzarote, it represents an ideal short break destination; a place to escape from the hustle and bustle of town life. Its main centre, a quiet village named Caleta del Sebo, is a small canvas of white washed houses separated by winding, sandy lanes, accommodating residents who survive mostly on fishing and the small supply of tourism. Also historically significant, the 1883 novel ‘Treasure Island’, written by Rober Louis Stevenson, is said to be based on an incident that took place on La Graciosa, with historians pointing to a real life Admiral Hawke who served in a battle just outside Lanzarote in the 1760s. 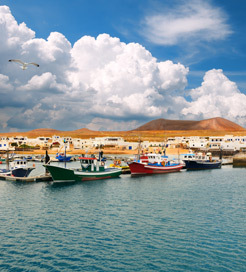 Given the idyllic conditions of La Graciosa, most visitors tend to enjoy long walks, particularly the 5 kilometre hike from La Caleta to the beaches, or hire bikes to ride around the stunning coastline. There is also a campsite on Playa del Salado on the western outskirts of Caleta del Sebo, ideal for night time gazing at a star-studded sky. Besides boasting some of the Canary’s finest beaches - the best being Playa de las Conchas and Cocina - La Graciosa also has the only 2 marine and fishing reserves in the archipelago. The marine reserve is the largest in Europe, allowing spectacular diving and snorkelling, and the beaches are popular with surfers. These areas can be reached via water taxi, while the onshore attractions are best explored on a 4x4 car. From Lanzarote, La Graciosa is just under half an hour away by ferry, with each ship docking in Caleta del Sebo on the southeast coast. Operated by a couple of ferry companies, the routes are run multiple times a day and so provide a convenient timetable for a day trip or overnight stay. For more information, please visit our Ferries from Lanzarote to La Graciosa page.